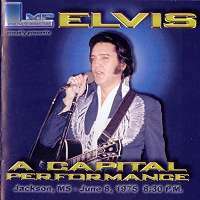 A soundboard tape from a concert in Jackson on June 8, 1975 caused a "battle" in the Elvis world of bootlegs. An ugly one! It has been released on two different labels, and especially one of these has used a lot of energy to tell which one is the best and which one not to buy! This soundboard tape does not deserve this amount of attention. It is not that special. On the other hand, it didn't deserve all the negative fuzz either. 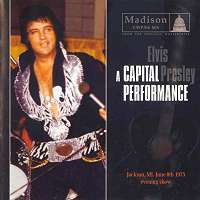 In fact "A Capital Performance" features a typical June '75 concert in any respect. It displays Elvis in great mood, singing good and joking a lot. All this in acceptable soundboard sound quality. There is no need to go into this show in particular as I could refer to all other soundboards from June 1975. However, Elvis performs an amazingly dedicated 'The Wonder Of You' this day. Too often he just rushed through this song. 'Love Me Tender' however is really messed up at the end. So much that Elvis repeats it! Most likely Madison and LMP have used the same source for their release. It could be that one has used a generation higher (or lower) than the other, but it is hard to tell. It is pretty obvious that none had a very good copy available. The sound is good, by all means, but not amazingly good! Another fact is that the tape is strangely incomplete. There is no mystery involved with the first tracks, but I find it unlikely that the original soundboard only featured some seconds of songs like 'Love Me', 'If You Love Me' and 'Love Me Tender' (puh! a lot of love there), together with an incomplete 'How Great Thou Art'. These could be so called identification marks that people create before lending or selling a soundboard tape to another person. This way it can be controlled who put it out, or who sold it to another person who in his turn put it on bootleg. Well, a bit of speculation there! Madison and LMP have attacked this task quite differently. It could be described in few words. Madison has used maximum of the Jackson show and than filled up with the Memphis, June 10 show where needed. This give some extra seconds of the show compared to the LMP release, but it also means several "clumsy" edits. Madison has used Let Me Take You Home as a source for the June 10 show and left the sound on that untampered. This means that you can easily hear where the CD goes from Jackson to Memphis and vice versa. LMP on their hand has spent their energy on creating a CD sounding like a complete concert. This means that some seconds here and there have been left out of the Jackson concert to find a sensible place to splice the two different sources. Due to the wish of creating such a "complete" feeling, LMP also had to reduce the sound quality on the tracks from Memphis, June 10. This is a bit annoying as you are forced to hear 'Also Sprach Zarathustra', 'See See Rider' and 'I Got A Woman' in much poorer sound than on Let Me Take You Home from DAE. However, it works in the sense of creating a smooth edit between the sources and overall give a feeling of listening to a complete soundboard. Madison has wisely enough marked where the tracks goes from Jackson to Memphis (not that it really was necessary as it is VERY audible), while LMP tries to fool the fans and give them the impression that their tape is almost the complete Jackson show, even promoting it to be a more complete release. Not very smart, LMP! LMP has, however included the comedy pre-program from Jackie Kahane (taken from Memphis, June 10 1975). This is previously unreleased. A nice touch, I think! Which one is better...or poorer? It depends on what you prefer. There is no doubt that Madison delivers a better product as a whole, mainly because their artwork is better and more dedicated. Madison is known for this. As I have said earlier, it is really necessary too, as all soundboards from Madison (leave Event Number 8 out) are from low generation tapes. A nice artwork adds appeal! Sound wise it is almost impossible to say which one is best. LMP has tampered more with the sound, not really successful, but all the same made the CD a bit more enjoyable to listen too. The clumsy edits on Madison's release really reduce the pleasure of listening to A Capital Performance. I think I would have chosen a CD release containing Madison's artwork and LMP's CD disc. Typical isn't it! © Oven Egeland, Elvis In Norway, March 2003.